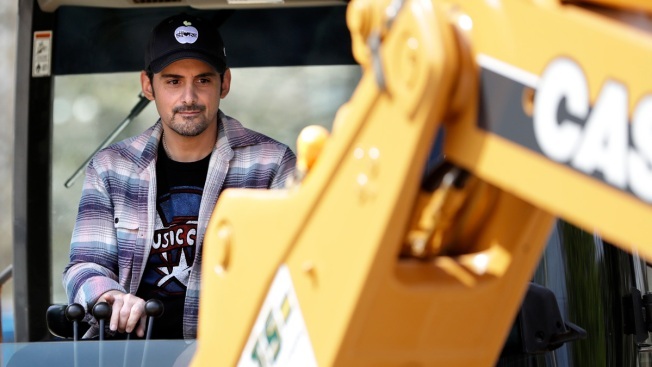 Paisley said this model "takes away the sting of embarrassment for a parent who maybe feels that way because they can't feed their kid"
Country music star Brad Paisley operates a backhoe as he breaks ground for The Store, a free grocery store for people in need, Wednesday, April 3, 2019, in Nashville, Tenn.
Paisley donned a cowboy hat-shaped construction helmet for part of Wednesday's groundbreaking ceremony for The Store, which is a partnership with his alma mater Belmont University. 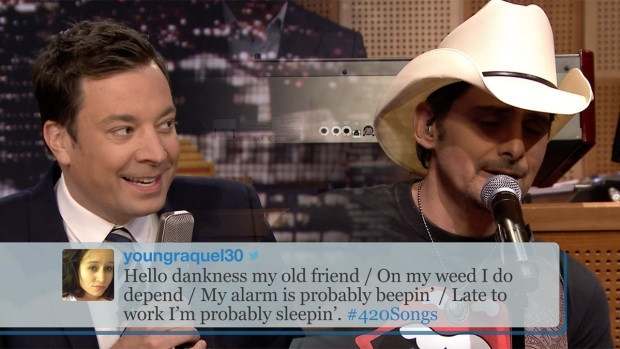 Jimmy Fallon gets some help from Brad Paisley singing his favorite tweets with the hashtag #420Songs. "We really want to get people before this is a major crisis," Williams-Paisley said. "We want to help people in this gap where they are trying to get back on their feet." The store will be located on Belmont's campus and next to the university's Ministry Center, which will provide health care and legal aid ministry clinics. Paisley said this model "takes away the sting of embarrassment for a parent who maybe feels that way because they can't feed their kid." "The kids should not know what their parent is going through," Paisley said. "That's not stress a child needs."